Celebrate Valentine’s Day one day early by treating your favourite people to my Grandma Agnes’ decadent Swedish Waffles next Sunday morning. Whipped egg whites, melted butter and sour cream – and a minimum of baking powder – take these to a higher level. They freeze well should you have any left-overs, which I sincerely doubt. I have not tried this recipe in a Belgian waffle maker, so offer no promises as to your success there. 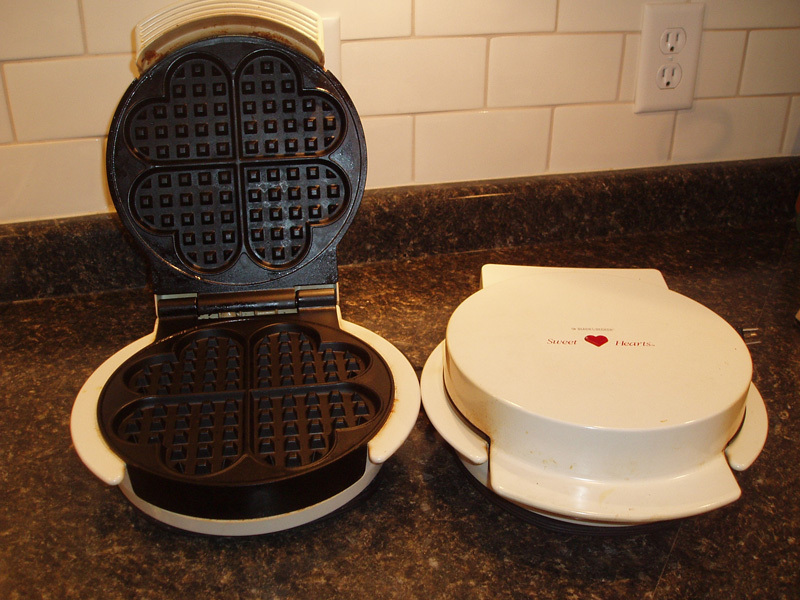 I have two Black and Decker Sweetheart waffle makers, and I get them both going to get a double batch to the table quickly. If you are keeping your first waffles warm in the oven while cooking successive ones, cover them with a thin tea towel kept far away from the element, so they don’t dry out. Whip egg whites until moderately stiff and set aside. Beat egg yolks with sugar until well combined. 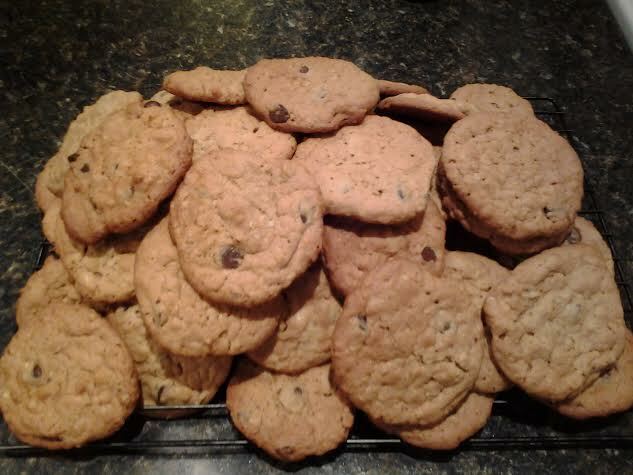 Combine flour, baking soda and baking powder and mix into egg/sugar mixture. The dough will be quite stiff at this point. Slowly add milk while continuing to beat at a low speed, scraping down bowl one or twice. Add cooled melted butter and sour cream, blending all ingredients well. Fold in egg whites fully. This can take a while if you are using a spatula. Lowest speed on a Kitchen Aid mixer does the job well. Prepare regular waffle iron using a light cooking oil spray prior to making first waffle. If your iron is well seasoned, you should not have to oil it for successive ones. 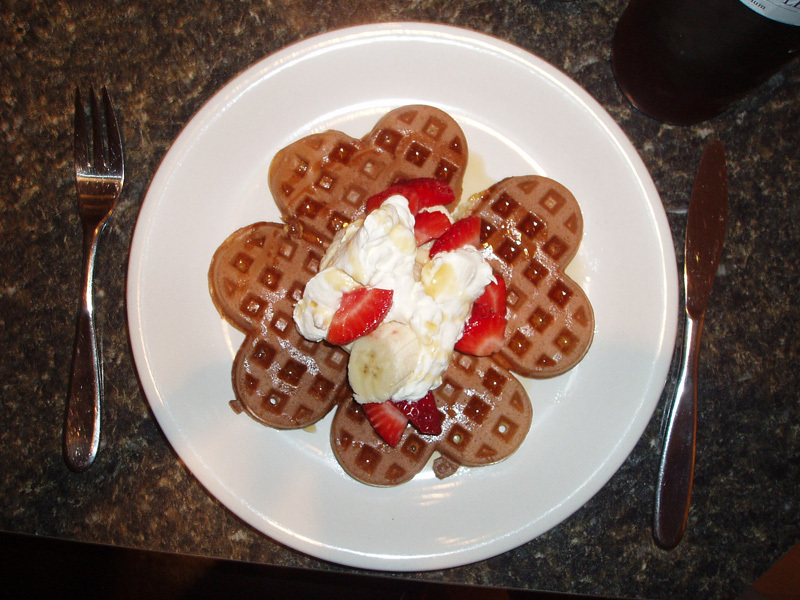 Serve with fresh fruit, whipped cream and real Canadian maple syrup.